Last winter, Elizabeth Carlson’s CHARGE: Wake Emerging Leaders group was brainstorming ideas and looking for new ways to positively impact campus. Common themes quickly emerged related to stress management and the time it takes for some students to walk from the library to their dorm rooms for study breaks and naps. With an overwhelmingly positive response from the group, the ZieSta Room became a serious proposal. And a technology-free space that is quiet and ideal for rest. Research shows that even 15-minute naps can increase retention, focus and productivity. So, students approached Associate Dean Susan Smith about creating a space conducive to mid-study naps. 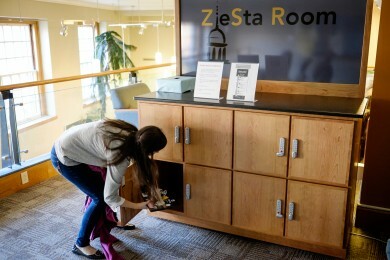 While falling asleep in the library is hardly new, encouraging it illustrates how ZSR is writing a new chapter on the wellbeing of students living in a 24/7 world. 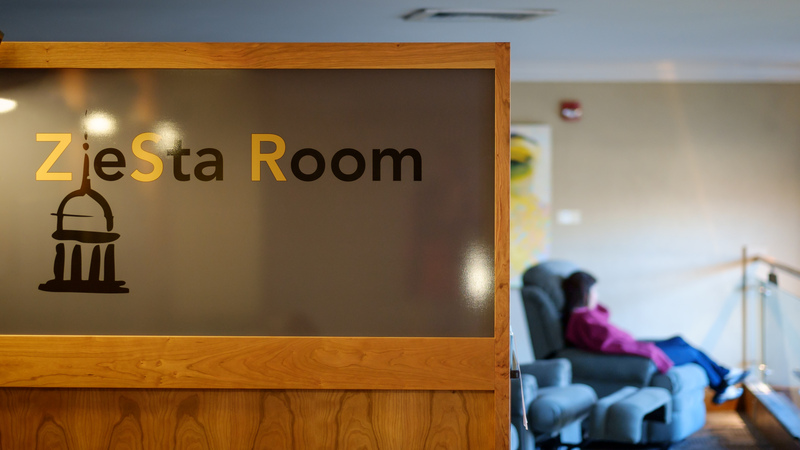 The ZieSta Room is the most recent example of how ZSR Library encourages optimal student wellbeing during peak times of stress. Extended operating hours: ZSR will be open 24 hours for students, staff and faculty starting Friday, Dec. 5 and will close at 7 p.m. on Saturday, Dec. 13. Relaxation Station: a refreshment station located in the Atrium that will provide treats for students throughout the length of Wake the Library. In September, Wake Forest introduced a new approach to wellbeing called “Thrive: Comprehensive Wellbeing at Wake Forest.” Equal parts education and inspiration, the campus-wide effort aims to give students, faculty and staff the skills, knowledge, resources and perspective to live healthier, balanced lives.